I have a fun project to share with you today. One of my best friends had a big birthday last week so what do you think my contribution to the party was? Yep......CUPCAKES!!! It's kinda my thing. I used my Cricut Explore to cut the Mouse SVG file at approximately 2.51 x 2.39" from black glitter paper. I also cut another mouse from black cardstock to create a backer. I sandwiched the lollipop stick between the two mouse ear cut outs using a strong adhesive and foam tape to make space for the stick. I used white satin ribbon for the bow and glued it to the ears. I then baked vanilla cupcakes in red/white and pink/white polka dot liners and topped with homemade white icing. I sprinkled the cupcakes with crystal sugar then stuck the toppers in! And this is what they looked like on the complete display! Super cute huh? I was very pleased with how they turned out. I hope you like them too. 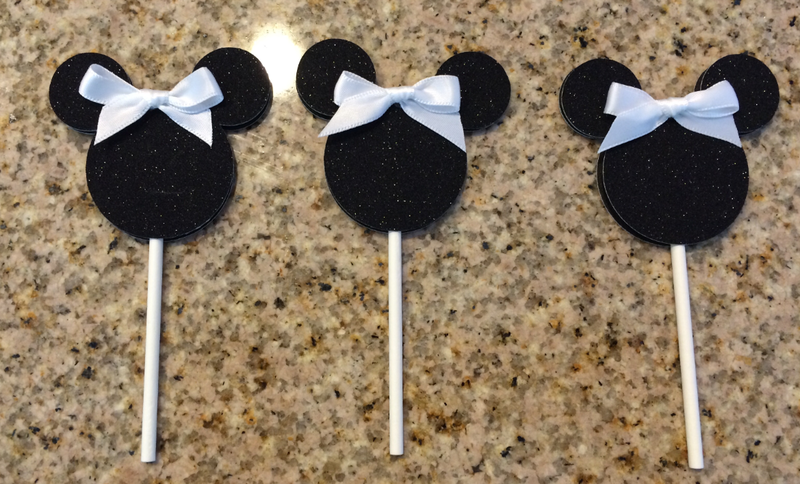 I am going to start taking custom orders for cupcake toppers if anyone is interested in ordering. Please message me if you have questions. I want to take a minute to welcome all my new followers. Thank you, thank you for your support. Please check back often for more inspiration!